Scribbling With Spirit: Cabela's is a Great Place to Draw! Cabela's is a Great Place to Draw! 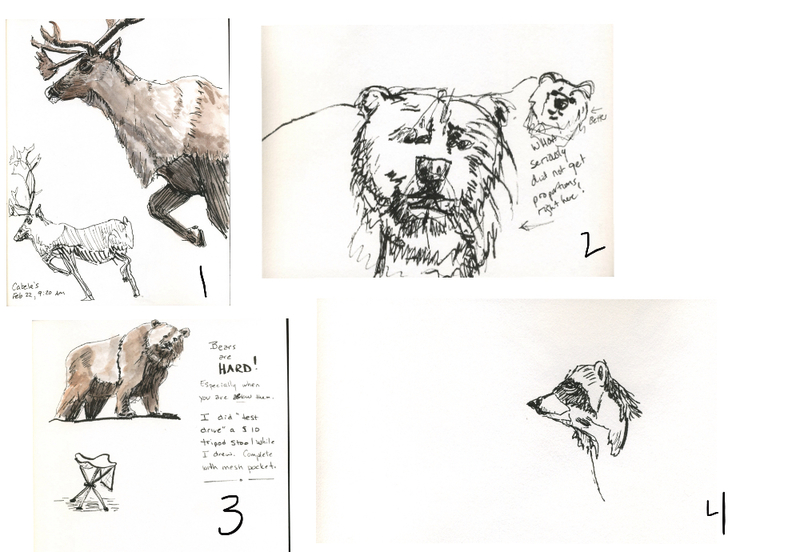 In late February, I headed out to Cabela's in a nearby town to draw taxidermy. It was a sad morning because of last night's random mass shooting in Kalamazoo, Michigan, which is where I used to live and some of my family still does. I'm going to do something positive for the planet, I thought, even if I don't totally get how it works. Thus, it was a great morning to get out and draw. I grabbed a folding tripod stool which I wanted to try out anyhow and sat on it for an hour to draw ($10 and very comfortable!). I didn't move at all, but just switched up what I drew. This gave me some odd angles--it was interesting to be beneath all of them too! I used the Pitt Calligraphy pen today, and my two colors of watercolor (Daniel Smith Burnt Sienna and Indanthrone Blue). Strathmore mixed media paper sketchbook. It took me an hour to do the drawings below. I very much enjoyed the slow drawing of the elk (the close-up). That took me nearly a half an hour as I considered shading and shadow and put paint on in think layers. The bear gave me FITS!! You can see from the big head my attempts to get the eye to nose proportions correct. As usual, I did better once I stopped trying to do it "right" and instead just scribbled to find the shapes and proportions. This loosened me up, so I practiced with the whole body. I will be going back to Cabela's and drawing that bear again. I had a little time let, so I drew the sketch of the raccoon, which is the thing I am most pleased with. I want to continue to work on accuracy and speed. When something like the bear flummoxes me, need to remember to scribble until I work it out. Funny thing: when I show these pages to other people, almost everyone points to that scribbly mass of the bear's head and says they like that best! Out of Time? Draw While You Stand Around! What Do You See From Where You Work? "My Experience is What I Agree to Attend To"